Monuments to shadows. Traprain Law walk. 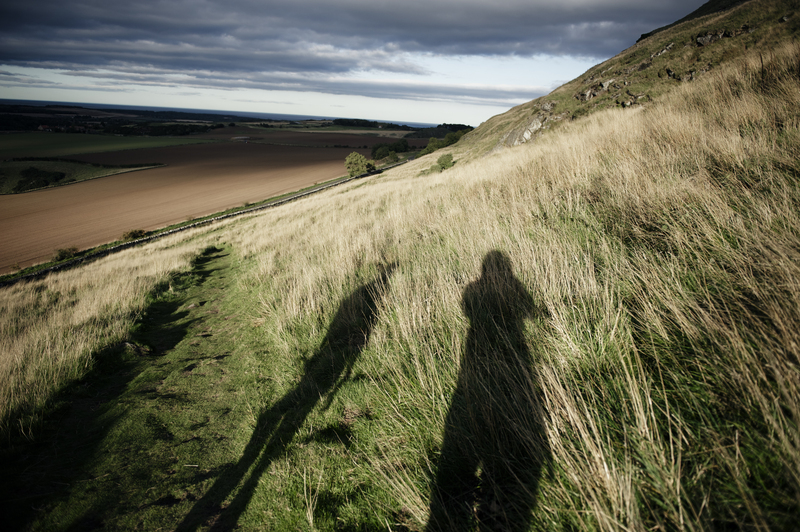 My recent climb up Traprain Law, in East Lothian, Scotland was as much an ascent into the Scottish hills, as a journey into a mental place for recollection. Previous trips when sheep would bleat among the folds of grasses and the odour of summer spent in the air, or that trip in the rain of an overcast day, amongst the familar panting of breathing, where recalled in my mind. Situated near the house where I had spent most my childhood, such a climb that seemed to evolve in tempo of hours, passed in the brevity of minutes in the mental sensibilities of a twenty-one year old destined to seemingly speed up his own conceptions of time passing. The monuments of stones that lie at the summit of these hills, serve as a reminder to time passing and a memorial to both geological and human time. People circling these stones in their small groups, or as single travellers, make paths around these monuments marking temporality around sculptures that are both long lasting marks of human activity and also will survive them. My parents and I would walk through the long grass of summer, that when green permeated the hills with a kind of consolation and wonder. In this constellation of enamoured green we would walk and I aged nine would run behind my mother and father, enrapt both by the air and the light. The lines we made in the grasses where fugitive scars upon the tranquility of this landscape and where there existed the possibility that I could partially own it; then it felt as if I knew this landscape and had become communal with the veracity of the sounds of the animals and the essences of their smell. Aged nine, the climb I experienced seemed to last for the same time I would equate to half a day of my present life, it was a time experienced intuitively, without presumption or analysis, but only in the process of bathing in it, of succumbing to the run up the hill and the sweet air, with colours that are more vibrant than now. I coloured these memories with the visions of a kind of naive consciousness, enamoured with acceptance and peace exalted in the run I took up the steep side of the hill towards rocks that I could tempt to climb, past backpackers verging carefully up the slope in measured pace. Then as I would admire the progress of this ascent, I would see the mound of rocks silhouetted against the skyline of Traprain Law, and I would recognise not only that I was nearing the summit of this hill, but also I would recognise a kind of transformation to the landscape, or the landscape of my mind. Bearing witness now, not to the natural, unadulterated landscape, but to a place marked by human activity. Upon my observation of this outcrop of human endeavour at the summit, my thoughts of the limitless ascent, the free flowing consciousness of the run, and the childhood energy of it where unconsciously dismantled. As if my sculpture of freedom had suddenly been shattered into pieces. When I glanced upon the summit, when I saw an end to the climb and a place for conclusion, the desire to reach it was lost; I would slowly and reluctantly drag myself to the top, making the last few steps with a kind of vanity and an urge to return again to the nature and the landscape that was not marked by the consummation of the land and the human hand upon it. Upon the elevation of the hill you can see the distant landscape of Scotland plough down before you, among grey clouds hanging, as if waiting for a moment to erupt in courage, and to decimate peace with the new tempting markings of rain. Sometimes in the resting places of the circle of stones I would cower, more relieved at the strength of the wind that seemed to engulf but also wrap me in a kind of agile clothing, which would subside to the wrappings of stones shielding me from its onslaught. Sometimes in the resting places of the circle of stones I would cower, more relieved at the strength of the wind that seemed to engulf but also wrap me in a kind of agile clothing, which would subside to the wrappings of stones shielding me from its onslaught. The sound of the wind would die away and be consoled by arid silence that seemed to hit my ears with a peculiar percussive hush; the gentle rattle of the rocks now lower and darker in tone. When you sit inside the cocoon of the rocks, you seem guarded as if in a new kind of womb, such a place is of both comfort and entrapment; in fact it is as if the luxury of stones pressing into your body, both reminds you of living, but also of being immobile in this cocoon. It is perhaps like being under anaesthetic, you cannot move and are no longer wrenched apart, limbs sometimes flailing by the arms of the wind, which although they are wrestling you, seemed to also be pushing you out into the world, pushing you into the cry of living. In the oppressive comfort of stones, little is ignited, save for a sense of claustrophobia, a passive tranquility, a place for thought. Yet it is in this interior place for the human mind, that there seems a kind of reluctance to step out of the bed of rocks, that willingly wraps you in its geological garment; shielding you as you are protected from the onslaught of the world – in its cruelty and suffering but also its light. In the crouched position your body is a paradoxical epitome for both protection and vulnerability; the outside world cannot touch you, but your body and mind now limitless are imprisoned, interred in the fabric of the rocks surrounding your every thought, breath and emotion, where they guard you from potential, life and the dexterity of that outer world, that world which wounds but also gives. Stepping from the cocoon of this entombed world is a relief, as you face the open wind again and hearing the bleat of lambs, like children of the world, living not in the mind’s vision, but in the vision of physicality – the senses, the feeling of grass caressing the limbs that wade through grass, as if wading through a sea, or the sting of nettles and bracken that bites you with the feeling that you are alive, that you are entrapped in this world of feeling, that is not only realised in the bite of thoughts, but the bite of the air and the taste of that summer that lingers viscerally in a veracity of vision that sometimes lies in its kindness. Leaving behind the monuments of stones, arranged by the hands of former travellers, descendants of the Traprain ascent; where placed momentarily upon the summit in the materiality of physical rock, their passages where remembered even in the air, I encountered even in the descent. Leaving the rocks behind I thought that I could find new monuments. The light was now behind our backs, as the sun slowly sank behind the horizon, perhaps like molten lead, and we would clamber down the mountain now, ungainly but fresh and new in this moment. The sunlight cast us as shadows, and for seconds we became immaterial monuments infused with energy like monuments to shadows. Text and images by Ad Howells. This entry was posted in Essay, Reflective and tagged East Lothian, Scotland, Traprain Law on October 16, 2013 by adhowells.